This Thanksgiving season take a moment and let your mind wander back to the autumn of 1947. That’s when the Greatest Generation again rose to meet a challenge and help those in need. They started the tradition of setting aside a plate at the Thanksgiving table for a ‘silent guest,” one of the world’s hungry. See my full commentary at The Cleveland Plain Dealer. Last week I wrote an article on Cincinnati.com about the Pope and the Friendship Train. When the Train crossed America in 1947 picking up food for Europe’s hungry, it was not able to make it as far north as Maine. They had to come up with another way to take part and they seized the opportunity. The Bath Iron Works in Maine was working on replacing the French fleet lost during World War II. They had just finished and were about to send the ships over to France. But why send them empty? So, the Maine Rotary Clubs went to work and filled up the first ship with food and other supplies. This included 107 tons of food and even seeds for spring planting of crops. The name of this ship was the St. Patrick. It arrived in France during March, 1948 close to the time of St. Patrick’s Day. Happy St. Patrick’s Day! With the election behind us, it’s time to focus on a major hunger crisis here at home and abroad. There are 50 million people hungry in the U.S. and worldwide there are 870 million starving people, a major cause of instability. In 1947, along the Ohio River, that same leadership spirit was in action when a train rolled by as part of nationwide tour collecting food for war-torn Europe. The Friendship Train, as it was called, was powered by the initiative and generosity of everyday Americans. Wheat flour, milk, beans, macaroni, spaghetti, eggs, dried peas, and other foods were collected. These donations came when Europe’s recovery was still very much at risk. Winter was fast setting in with food supplies running low. George Marshall, then Secretary of State, said, “from this time on…every man, woman and child in this country will exert a direct personal influence on the course of international affairs.” And they most certainly did in helping feed Europe’s hungry. The Friendship Train preceded one of our most successful foreign policy initiatives, the Marshall Plan that rebuilt Europe from the ashes of World War II. Every American today can have a similar influence, whether feeding war refugees and flood victims in South Sudan or a hungry person in Syria or Afghanistan displaced by conflict. If everyone became a leader, had their own type of “Friendship Train,” this would be the biggest contribution to peace that can be made. It does not take much to make a difference. Even one dollar buys a week’s worth of meals for a child. A church I visited had a collection jar for such a purpose called Change for a Change. Anyone with a computer can play the online game FreeRice and raise funds for the World Food Programme. Organizing a fundraising road race or walk in your community can also send a powerful message that world hunger is a top priority. We cannot expect there to be peace with millions of people malnourished and children stunted in growth. The instability we see in the world will never cease unless there is food, hope, and opportunity for all. At home leadership is needed too, with many Americans struggling to get enough food for their families. Unemployment, health issues, or natural disasters like Hurricane Sandy place people in need of emergency food banks. We have to make sure that these foodbanks have enough supplies. That is where citizens can take the lead in organizing canned good collections or online fundraisers. Athletes can use a cell phone app called Charity Miles to raise money for Feeding America as well as the World Food Programme. Combining your charitable acts with messages to the President and the Congress can make leadership contagious. You can encourage Congress, for instance, to pass legislation helping the hungry such as the upcoming Farm Bill. Today, there is enough food worldwide to feed all the hungry at home and abroad. It’s not a question of resources as much as leadership. That is where you can come in to take charge in confronting the food crisis facing our planet. Article first published as Take Lead in Fighting Hunger at Home and Abroad on Blogcritics. The Associated Press reported back in 1948 there were two people in Nebraska that had a “complaint” about the Friendship Train. They were disappointed it could not make a stop in their area. So what did they do? They started their own train. They called it the Abraham Lincoln Friendship Train. The charity Church World Service came to support this train through its Christian Rural Overseas Program (CROP). Today this same group operates hunger walks all around the country which support food aid both at home and abroad. 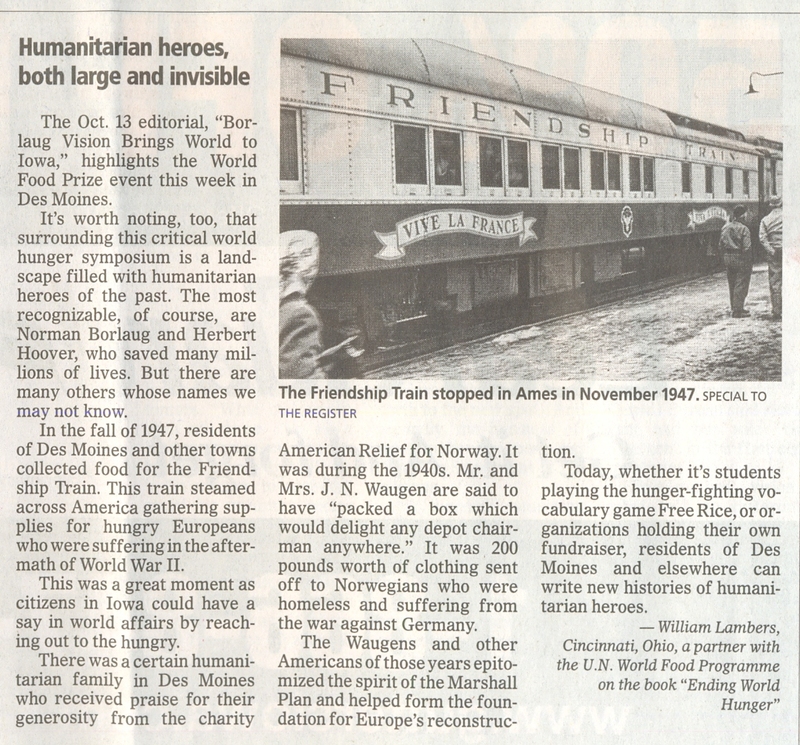 In 1948, the Abraham Lincoln Friendship Train got its start in Lincoln, Nebraska and went across the Midwest picking up more food for Europe. More trains followed. States like Ohio had their own train picking up wheat and dried milk to be shipped on to Europe for the holidays. The response was so great that train delays took place because so much food was being donated by Americans. Newspaper reports at that time estimated over 2000 train carloads of food were collected. While this grassroots effort was ongoing, the Marshall Plan to rebuild Europe was under way. This was American peacemaking at its finest. It came from all Americans, whether they were leaders in Washington D.C. or farmers in the Midwest. With nations in such distress after the war, Americans responded with generosity and friendship. This is a sharp contrast to plans today by the Congress to reduce international food aid when there are countries that are suffering deeply in hunger, malnutrition and poverty. What hope do the world’s nearly 1 billion hungry people have without food and nutrition? What hope do we have for peace if another generation is stunted in growth and mind because of lack of food? There is no more important step toward this goal than feeding the hungry. 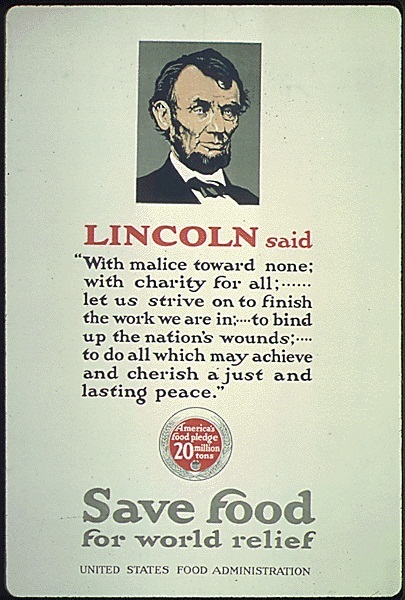 Article first published as Abraham Lincoln and the Fight Against Global Hunger on Blogcritics.